Saturday, June 8, 2019 at 9 a.m.
Having a passion for Hawaiian language, culture and hula, Ka’ea has enriched the lives of our keiki as a kumu with several Hawaiian Language Programs from Punana Leo- Hawaiian Language Preschools to Ke Kula ‘o ‘Ehunuikaimalino – Hawaiian Language Immersion School for 20 years, until moving to radio fulltime in 2011. She is also a lecturer at the University of Hawai’i Center at West Hawai’i Community College and now teaches Hawaiian Language College courses at HCC and Haleo, while still supporting the kids at Ehunui whenever she can. Ka’ea joined the morning team with Jaz in January of 2011, and is the Content & Brand Manager for KAPA Hwn FM. She continues to spread her Knowledge & Passion for Hawaiian Culture & Language by keeping KAPA active in the community helping to perpetuate the Hawaiian Culture and is Founder of Kako’o I Na keiki Program and the Lahui Project, which benefit Big Island keiki. 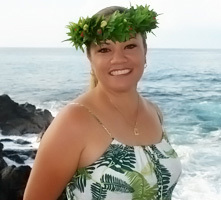 Ka’ea has had the blessing of traveling throughout the world and the mainland USA sharing her aloha through hula. Through over 25 years of study, she has graduated to Kumu Hula from the award winning halau, Nä Lei ‘O Kaholokü, under the direction of Kumu Hula Nani Lim Yap and Leialoha Amina. Ka’ea continues her desire to humbly serve others. While strengthening and nurturing cultural identity by enriching community relationships through education, Hawaiian culture and language.